A controversial twin-tower development at 80 Flatbush Avenue that will soar hundreds of feet above brownstones in Boerum Hill has been given another green light. The City Council’s Subcommittee on Zoning and Franchises unanimously approved the project during a hearing Thursday after the developers shrunk the project by 130,000 square feet and cut down its tallest tower from 986 feet to 840 feet, according to Crain’s. “[The project] has presented a number of unique challenges,” said local Councilman Stephen Levin, who had demanded the project be downsized. The project, led by Alloy Development, has been met with resounding objection from local residents who fear the site will ruin the leafy neighborhood with shadow, while the city acknowledged the need for population density next to the Atlantic-Barclays transit hub. In June, Brooklyn Borough president Eric Adams issued an advisory requesting the project’s tallest tower be shrunk to 600 feet, in a bid to temper fears of residents that it will overwhelm the neighborhood. As a result of the modifications, the project will have 870 apartments — 30 fewer than originally planned. However, 200 affordable apartments have been kept. The site will also include commercial space and a new elementary and high school. The project now awaits approval from the entire City Council later this month, which will likely to vote in line with the subcommittee. 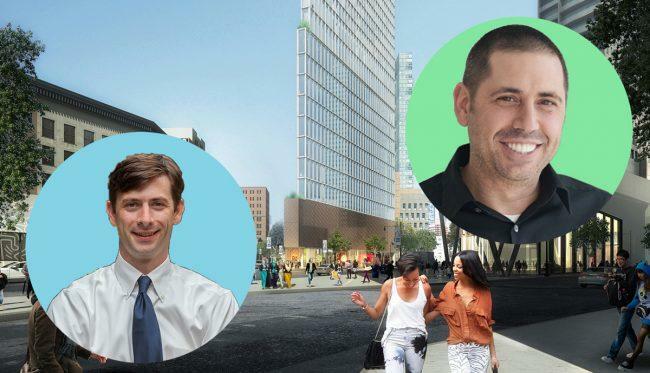 The development is one of several underway in Downtown Brooklyn. RedSky this month purchased 571 Fulton Street for $14.5 million, as part of their $100 million, more than 12-building Fulton Street portfolio.